No. 1 App for file transfer on iPhone/iPad! Most secure file download/upload tool for business and professional users. Upload local files, photos/videos, or music files to FTP/FTPS/SFTP servers, iCloud, Dropbox, Box, OneDrive and GoogleDrive. Download files to your device from FTP/FTPS/SFTP servers, iCloud, Dropbox, Box, OneDrive and GoogleDrive. Support both user name/password and Private Key authentication for SFTP servers. Support both PPK and PEM keys. Support importing keys from/exporting keys to iCloud Drive under iTransfer/keys folder. Email local files, photos/videos, or music files. Manage files, including adding a folder, renaming, searching, moving or deleting files. View supported files, including: PDF, DOC, EXCEL, PPT, image files, MP3, TXT, video files, etc. Open files using other Apps through "Open in". Support launching with a password. Share photos on Facebook, Twitter and Weibo. 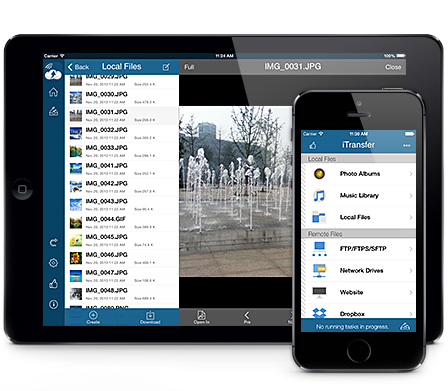 With its simple interfaces, iTransfer Pro provides the easiest way to transfer files on iPhone and iPad.